The French contingent of the So Organic team is taking part in a fun run to raise money for Trees for Cities, a charity that works at greening urban spaces all over the world for leafier places to dwell. Their mission is "to advance the education of the public in the appreciation of trees and their amenity value, and in furtherance of this the planting and protection of trees everywhere, and in particular inner city areas". Tree-Athlon is a 5km run. There are 3 being held across the UK this year - one in London, Leeds and Manchester. Projects Tree for Cities have initialized include establishing wildlife gardens at schools and protecting woodlands across the country. Other than greening UK cities the charity is planning to go international and help plant fruit trees and indigenous plants in Peru, Addis Ababa and Nairobi. The London run is scheduled for the 19th of September at beautiful leafy Battersea Park. Participants wear bibs with a personalized Tree Wish to encourage sponsors with their individual tree goal. All those who run in the London Tree-Athlon receive a sapling to take home and plant. Entry to run is £20.00 which of course goes to towards the charity's activities. But you can also create a Just Giving page like Christelle. If you'd rather sit than run under the trees perhaps you'd like to sponsor Christelle on her leafy quest. She's aiming to raise £500. Her sponsor page is www.justgiving.com/SoOrganicForTrees/ if you'd like to make a donation. 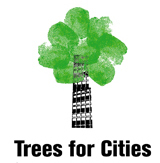 Alternatively if you'd like to become a member of Trees for Cities they offer four membership packs starting at the Sapling Club Membership (‘for growing kids') at £1.50/month which will plant one tree a month to a Family Tree Membership at £6/month which will plant six trees a month.